Once again the New York Knicks continued to prove that they are one of the most incompetent front offices in major sports. Instead of trying to move aging star Carmelo Anthony to create cap space or pick up draft picks for future talent, New York has once again become disillusioned with reality. The Knicks still believe that they can build a contender around Melo. Despite not having cap space, talent, a proven track record, and of course aging Anthony. At 31, Melo is coming to the end of his prime in the NBA. He’s been in the league for 14 seasons, that wear and tear is going to catch up with the all-star sooner rather then later. Look, I’m not saying the Knicks would have gotten a big haul for Melo, but they could have created cap space and gotten some pieces to put around Kristaps Porzingis. One of the major issues is that the Knicks still dream that Melo can bring them a championship. Uuuhhhh no, that is not going to happen. In case you missed it Anthony has only made it to the second round of the playoffs twice in 13 seasons. The best case scenario is that over the next three seasons the Knicks will make the playoffs as a low seed, only to get obliterated in the first round. New York is building around a star, it’s just not the right one. Just to clarify. I AM NOT SAYING THE KNICKS SHOULD TANK! Thye have a young emerging big man that can shoot and if they draft well could be a very competitive team in a few seasons. Realistically, can you see Melo and Zingis taking on the Cavaliers for the next three seasons? The problem is the Knicks are building around the wrong star. They had the steal of the 2015 Draft in Porzingis and they’re not going anywhere fast. Why not wait to build a solid core for the future instead of chasing the impossible dream that Melo will hold the NBA Championship in the Canyon of Heroes? Could the Knicks move Melo this summer? It’s possible, but Anthony’s max contract coupled with team’s shedding cap space for free agency doesn’t bode well for New York. And for Knick fans who think that Kevin Durant will be playing in the Garden next year, it’s not happening. New York has only $19 Million in cap space this offseason and will not entice Durant with a contract, and certainly won’t with the current roster make up. Let’s face the facts. New York is an aging, overpaid, and underwhelming basketball team. 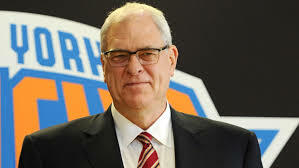 Phil Jackson will have a huge test this offseason with the lack of cap room, but with Melo still on the team, it’s just prolonging the chance for a NBA Championship contender to play at the Garden.